This is easily the most obnoxious thing people say when first meeting me and they are not involved in the sport of strongman (or any strength sport). The implication that lifting is some mindless pursuit could not be further from the truth. The pursuit of strength as is noble as any athletic endeavor, and to insult the deadlift is silly. It is the heaviest of any movement and the truest test of overall absolute strength. 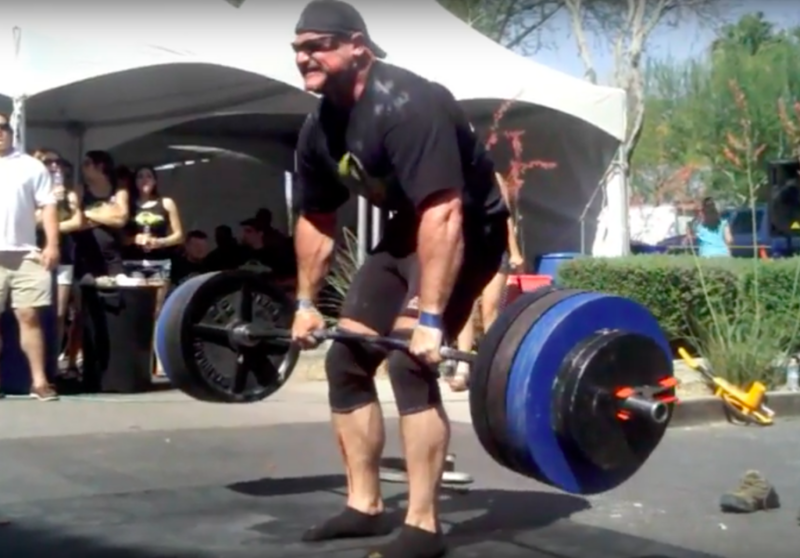 The deadlift is tested, in some fashion, in almost every event in strongman. Literally, before you can use that object, you have to pick it up. By definition this is a deadlift. It is also the number one thing competitors tell me they need to improve to win more contests. The issue is, many people hit a sticking point in the movement that can last for a very long time if they do not know how to break through. A solid warmup is going to help your pull. The deadlift requires the biggest muscle groups in your body to fire in unison for a truly great lift. Two movements that will really get the blood flowing and increase your core temperature are high rep kettlebell swings and pull-throughs. I hope at this point you are proficient with a proper swing and 3 sets of 15 should do the trick here. We should ensure that you aren’t making any rookie mistakes. If you are, a simple correction of any of these can throw pounds on your pull today. Hip Rise: Are your hips moving up without the bar leaving the floor? The second you begin your lift, the bar should move in unison with the body. Now, to be clear there is more than one accepted start position for the lift, and many elite lifters do a modified stiff leg but the bar should come off the floor when you pull it. Keep your eyes and head up and when you begin the lift bring your chest and back up in unison with your legs. This will cause the bar to come off the floor. Bar too far away: Is the bar against your shins for the start of the lift? No? Simple fix: have the bar on your shins for the pull, then continue to keep it in contact with the body. See how easy that was?! This is simple physics: the further away from your body the weight is, the more difficult it is to lift. Bigger lifters my struggle to keep it close and keep their shoulders over the bar. If this is you, just get it as close as you can. Weight distribution: Like a squat, keep the weight on the heels and the outside of the feet. If you move to the balls of your feet at all, you are going to tip forward quickly. Control the weight at all times and push down into the floor! Those are just a few of the more common mistakes you should eliminate before getting serious with this lift. I’ve heard far too many horror stories stemming from deadlifts gone wrong. The author with a 700+ pound pull. Once you are lifting correctly try working in the following exercises to start hitting bigger poundages. Pendlay Rows: A bent over row with a big variation. You start by pulling the weight off the floor with every rep. To maximize this exercise as a deadlift helper, go heavy for threes or fives and practice keeping your weight back on your heels, having a dynamic pull and a controlled lowering of the weight. This is a great aid to people who have a great lockout but struggle off the floor. Rack Pulls: As a coach I’ve used these from above and below the knees to increase max lockout. They are also great for hammering on muscular endurance and building the posterior chain. A technique that you can try on this is the one set to failure method. After a serious warm up, take the heaviest weight you can pull for at least five reps and go for broke while maintaining form. At failure your entire body should be exhausted and that’s all for the day. Side Handle Pulls: Frame, Farmer’s, or Car Deadlift apparatuses all work here. The side handle pull greatly changes the mechanics of the exercise. The weight is more comfortably distributed when pulling with your hands at your side and you can pull more here than you would on a traditional loft. These are good for overloads or reps and are great to work in on event days. Good Mornings: A staple of every strength athlete’s program and typically done after squats, this exercise uses the posterior chain as the prime movers. Make sure these are performed in a power cage with a solid safety set up. Triples are great here, but use a weight you can always control while maintaining spinal integrity. I always have my athletes do a super slow eccentric on these with a much more dynamic concentric. The Box Squat: For athletes the have a hard time breaking the weight from the floor, the box squat can be a tremendous help. Use a box that will be at the height of your glutes at the start of the pull and have your feet in a similar position. This will overload the hips and lower back to build a dynamic start from the floor. If you have always done traditional squats, adding in this exercise can really up your power. These compound exercises should be programmed into a template with the realization that they are all similar ways of working the same muscles. There is no need to throw them in all at once. Try subbing your regular squats one day a week with the Box and switching your rows to the Pendlay style for a few weeks before throwing in anything else. The added benefit of these exercises, as well, is going to increase overall body strength and all your lifts will be going up. Never pull maxes off the floor in the gym. Always save them for contests. Heavy singles are fine but should be complemented by speed work. Sumo isn’t allowed in Strongman so most skip it completely. It’s the least technical of the lifts, so if there is one lift to get your adrenaline up for, this is it. The indirect work of box squats and rack pulls is so effective for many lifters that they only pull off the floor as a tune-up right before meets. Use straps on overloads, if grip is a question. Don’t miss training lifts due to weak hands. Getting your deadlift up is a surefire way to increase your overall performance in the sport of Strongman. By working hard and smart the above tips will pay off and set you on the road to some huge poundages. Now get pullin!